Quentin Smith, 30, was arrested on Saturday after the shootings of Eric Joering, 39, and Anthony Morelli, 54, in Westerville, a suburb of Columbus, says police spokesperson. A woman who identified herself as the wife of the suspect in the killings of two Ohio police officers told a 911 emergency operator that her husband shot the men, according to a recording released by authorities on Sunday. "My husband, he shot the police officers," the woman says in the recording, referring to the suspect, Quentin Smith. Quentin Smith, 30, was arrested on Saturday after the shootings of Eric Joering, 39, and Anthony Morelli, 54, in Westerville, a suburb of Columbus, said Christa Dickey, the spokeswoman for Westerville's police department. Joering and Morelli were responding to a domestic disturbance call when they were shot. 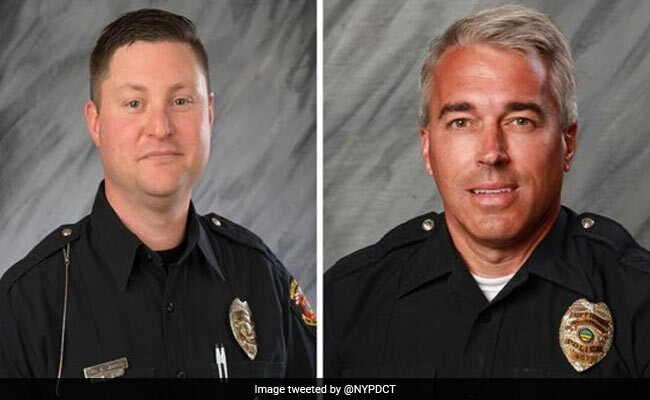 President Donald Trump on Sunday again offered prayers for the two officers. "Just spoke to @JohnKasich to express condolences and prayers to all for the horrible shooting of two great police officers from @WestervillePD. This is a true tragedy!," Trump said in a message on Twitter. Kasich is Ohio's governor. It was the second time that the president had tweeted about the shootings. Excluding the shootings in Ohio on Saturday, 12 U.S. law enforcement officers have been killed in the line of duty this year, nine in firearms-related incidents, according to the non-profit National Law Enforcement Officers Memorial Fund.